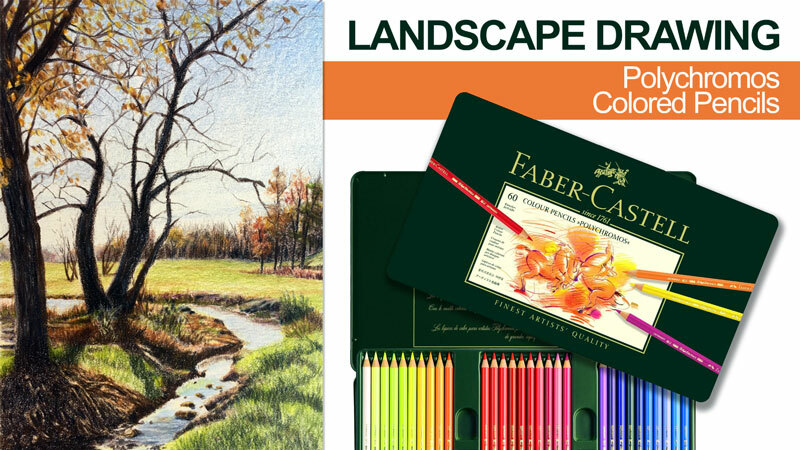 A five-part series on landscape drawing with Polychromos colored pencils. Learn how to layout the composition with light graphite applications and begin colored pencil applications in part one. Part two features the development of the middle ground and distant tree line, while part three and four focus on drawing the trees in the foreground. In part five, the image is completed by addressing the stream and extreme foreground. Hi Matt, great lesson, it was actually the first one I’ve watched as I’m a new member. Really looking forward to this Thursday for lesson 2. I have heard that Prismacolour premier pencils are not of very good quality and seem to break often and that is why I purchased Faber-Castell, what’s your opinion on Prismacolour? Matt, Lyra makes a blender pencil that comes in there 72 colored pencil set which is oil based, as one of the viewers ask this question. love this, I love all of your tutorials , I love your teaching style. The 36 piece set may have one in them, I don’t know if you can buy seperate. Would it be possible to list the colours used in the Materials so if we do not have the pencils as in the Polychromos rang ewe can buy them in advance rather than watching the video in its entirety. I am fairly new to your site but the demos are excellent. Thanks for your question. During Live Lessons I am making decisions about color as the lesson takes place. So, I’m not sure what colors I will actually use until it comes time to use them. I can perhaps list the colors when the entire series is over. Is it possible for you to list the colors used in this lesson? I have the 72 Prismacolor Premier set and am hoping to use those to follow along with this lesson. Thank you for your help! I look forward to getting started. Hi Matt, could one use color oil pencils on a regular canvas like regular oils? and your not going to blend any of this????? Not all colored pencil applications and types of colored pencils need to be blended. And in some situations, the artist may choose not to blend applications at all. We look at many different approaches to using different mediums for producing art throughout the site. In this particular series, oil-based pencils are used on Stonehenge paper. I decided not to blend the applications and instead allow the texture of the paper to play a role in the finished look of the drawing. Loved this Matt…your teaching is so clear and concise…thx!